Posted by Martin Koser on 10. 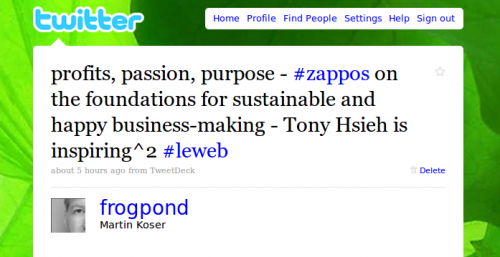 December 2009; This entry is filed under Business Models et al., English posts, Innovation et al.. This has been a highlight of this second day at LeWeb 2009. Tony Hsieh, CEO, Zappos.com, blew away the crowd this morning at LeWeb with an inspiring speech about meaning/purpose and happiness. A long applause followed his presentation. Sebastien compiled a write-up of Tony’s talk here, some tasty bits on the real success factors in business today. Everyone should take a step back and ask what is your goal in life and the reasons why it’s your goal? and then you should ask why you answered that? and try it again.